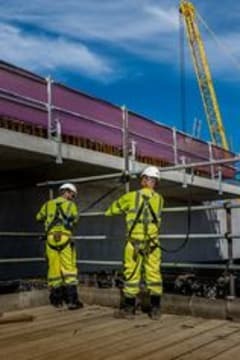 The DSL achieves a 50% improvement on the requirements set out in EN355 and opens up the potential to effectively protect workers in previously difficult locations as well as improving security further for all others. When it comes to Fall Arrest Lanyards most users currently choose a full 2 metre version for maximum freedom of movement, but in doing so have to accept they will allow potentially longer falls even when the full freedom of movement is not required. The problems with falling are twofold The further the fall (The freefall distance) the longer it takes to arrest or stop the fall in a controlled manner (the arrest distance) The further you travel during either the freefall or the arrest phase the more likely you are to collide with obstacles or the floor. Having a lanyard the right length for each task would keep the potential fall to the minimum, but in the past was not possible. The choice was either freedom of movement or security – not much of a choice really. When launching the original DSL in 2012 SpanSet made it possible to have what users really wanted - a full length lanyard with the capability to be anchored at its full extent below the worker if required, but retractable to remove excess length when not needed, providing users with a far higher level of security especially when working at low levels or above hazards such as machinery or structural elements. The DSL 2 retractable lanyards go further, extending and retracting in use as required, but additionally during a fall they continue to retract resulting in significantly reduced falls that are consequently quicker to arrest. The benefit is so significant that in tests the DSL arrests the falling mass completely before a conventional lanyard even becomes taught.